“Why Are Good Looking Guys Hooking Up With Ugly Girls?” REALLY? 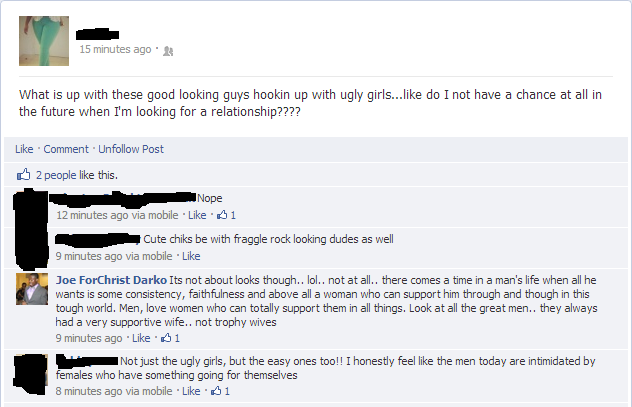 A friend of mine posted on Facebook that “Whats up with good looking guys hooking up with ugly girls…?” When I saw this on Facebook, I immediately commented just to share my opinion as to why the “good looking guys” might go in for the “ugly girls”. Below is a snap shot of what she said and my brief answer. As you can see from my response, I do not believe that any guy gets up and says “well, let me go in for the “not so good looking girls”. Being a guy myself, I know that we are usually moved by what we see. If what we see is presentable before our friends, then we believe everyone will see us as manly and will see us as the “alpha male”. The trick is, there comes a point in a man’s life, when his goals becomes more clear; as he aligns his goals properly, he begins to feel the need to find a woman who will be there for him through and through. He begins to look for the intangibles in a woman. He begins to look for a matured woman, a woman who can support him, encourage him, be faithful and committed to him and most importantly, a woman who can bring his goals and dreams to life. He begins to look for all these things, besides outward appearance, because his goals and dreams are far more important that what can fade with time. Secondly, looks are deceiving and they do not always tell the whole story about an individual. Another point to consider is that, “one man’s trash, is another man’s treasure” and “one man’s meat, is another man’s poison”. What you may find dirty, someone may find gorgeous and what you may find ugly, someone may find beautiful. Boys in fact do grow up to be men who don’t focus on outward beauty alone, but inward beauty; because as we get older, we realize that outward beauty fades with time, but inward beauty persists. Probably some of these men are going in for the “not so attractive women” because they do things these so called “pretty women” do not do. Yes, it is good to look pretty all the time, but to men, it is better we get fed, so we most of the time need a woman who can cook. It is also good to know that you have a woman who can support you, help you build a strong network to succeed. Take a minute and look around you. Look at all of your successful friends or all the great people you know and you will realize that behind them is a supportive woman. This woman might have the looks, which is always a plus, but most importantly this woman has what it takes to cater to her man. Females, do not get me wrong, it is good to look pretty, but know that a wise man will always appreciate you and accept you for what is inside of you and not what is outside of you. I have a beautiful sister who got married last year. If you know my family, you will know that we have been blessed with the genes of good looks :). But on a more serious note, my sister Jennifer is very pretty, so because of her looks, my mom always advised her that “when it comes to marriage, looks will take you to your marriage home, but your personality will send you packing”. My mom was just trying to remind her that she should continue to build her character as a woman and continue to keep that positive character as a woman in her marriage. I hear a lot of girls say that “these men are cowards, they are are afraid of bold, strong, and beautiful woman and they are afraid of women making it big”. Well, anytime I hear this, I cringe all because it is not accurate. Not all men are cowards and not all men are afraid such a woman. What the men probably do not see are your intangibles. Besides you being successful, beautiful, bold, and all that, do you have the intangibles which he finds very crucial to have? Or are you only flaunting what you think will get him attracted to you? If you can’t support him, can’t cater to him, can’t cook, then why would he want you? He is not a coward, but rather bold, because it takes a lot to find such a woman in today’s society. Such a woman is considered virtuous and like the Bible says in Proverbs 31, “..a virtuous woman who can find? for her price is far above rubies..” Meaning, she has a worth. She is worth something. If men are not coming to you because of your looks, then this should hint to you that, to them, your looks is admirable, but probably not worth a whole lot in the long run. The secret is, the alpha male world does exist for men and in that world, men are competing against each other to rise to the top to fulfill their goals and dreams. This group consists of the vast majority of men in today’s society, and they will do anything they can to get to the top. Most of these men know that, in order to kept to the top, they need their sanity, they need to be taken care of and they need someone to love and accept them. Because of this, they go in for women who can deliver on what they consider deal breakers or intangibles. Such a woman will not only help him get to the promise land, but excel beyond his dreams. These men working to get there do not need a “trophy wife”, because they do not have the time to waste and certain issues which might come with having a trophy wife. If you have noticed, men who are working hard on their way to success, do not care for looks or “trophy wives” – if you have that, then it is a plus. But men who have already made it and I mean “made it” usually go after the best looking girl possible as trophy – hence the phrase trophy wife. This wife is there to make the man look good and send a signal to all the other men that, “I can win and win BIG TIME – look at my wife. Don’t get me wrong, this is not the case for ALL successful and well to do men and there is nothing wrong being the trophy wife, if you want to. But do you want a man to see as you as “Add On” or do you want a man to see you as a partner who is crucial part of his plan? If you choose the latter, then you have to make it a point to develop the the intangibles. I would like to leave with a quote by my aunt this morning: “Looks are wonderful, but if you’re also a man of wisdom and you love knowledge, please don’t deal with dumb pretty girls. You’re wasting time and blocking your blessing”. So to answer my friend’s question in nutshell, I would like to say that no one is downplaying good looks, but everyone is praising great character and that is probably what these “good looking guys” see in these so called “ugly girls”. Share this Article. Share this Blog. Share your thoughts! Does God Choose Your Spouse For You? Just Stop The Facebook "Bible Verse Challenge" !